FOREWORD: The primary purpose of any standard is to guide the breeder in his quest to produce uniform specimens that most nearly resemble the ideal. It follows then that this standard must also be the guide for the men chosen to judge our shows, and consistent evaluation in all sections of our scale of points is our goal. We hope to impress in the minds of all members that the Modena is a balanced bird with many equally important sections; that we should recognize and search for desirable traits and not be overly concerned with minor faults; that in the evaluation of each bird, the judge must adhere to the scale of points regardless of personal preference. SIZE: Using a given figure of nine inches shall serve as an approximate for the Ideal Modena height. Seven inches to serve as approximate length. In breaking down to three parts: it shall be approximately three inches from the top of the skull to the low part of the back. The body profile, from the low part of the back through the body to be approximately four inches in depth with approximately two inches of leg extending below the body profile. Bird shall be as short as proportionately possible. SHAPE: Chest broad, round and prominent, back wide at the shoulders, short and well rounded, not flattened, body to be deep, short, broad and cobby with rump broad enough to support the wings. The shape shall be well rounded in a graceful curve when viewed from any angle. The legs to be located in the direct center of profile. STATION: Proud and erect, with head held high, though not strained or stretched as from fright. Eye and wing juncture with body shall be on a perpendicular line. The tail to be curved upwards at an angle that would level at the bird’s neck at approximately one third the distance from the low point of the back to the top of the skull, or approximately one inch. The flights to rest as flat as possible on the tail. HEAD: Shall be of medium length, approximately two inches from front to back on a level line of the eye and approximately one and one-eighth inches wide. Top of skull to be well rounded. Curve of head shall be graceful from beak to neck. BEAK: The beak shall be short and broad, approximately five-eighths of an inch from the feather line above the wattle to tip of beak. Dark colored birds to have dark horn beaks, light colored birds to have flesh colored beaks. Both types to be free of any discolorations. The wattles shall be small of fine texture. Recessive red to have light horn beaks. EYE: To be very bright and prominent, iris, shading from orange to orange-red, with plenty of luster. Whites to have either "bull" colored or orange eyes. Eye to be approximately five-eighths inches from top of skull to the center of the eye. CERE: To be fine and even in texture, with color shading to blend in with the color of the bird so as to be as inconspicuous as possible. Ceres on whites to be light red. NECK: Of medium length or approximately three inches from the low point of the back to the top of the skull. It shall graduate in fullness from top to chest. No distinct gullet, but not pinched at the throat. Neck shall be tilted slightly back with no trace of neck shaking or over styling. The "stout bull-neck" is most desirable. WINGS: Short, deep tightly folded, carried well cocked up. Wing butts shall blend smoothly with the chest, with the tips lying upon the tail. Flight feathers to be short and broad. Covert feathers to meet on the back so there is no hole or open back showing. KEEL: Shall be as deep as possible, fairly short and curved with the contour of the body from front to back. TAIL: Very short and broad webbed. To be folded tightly. Tail to be curved in a graceful curve. Tip to be approximately one inch above the low point of the back. Tail shall be approximately one-quarter inch longer than the wing flight. LEGS AND FEET: The legs to be approximately two inches in length. To be very straight, with thighs well shown. The legs, feet and toes to be a bright red and free of any feathering. The toes to be of fine texture and well spread out. Dark horn colored nails to be on dark colored birds and light flesh colored nails on light colored birds. Legs to be as wide apart as possible to keep the bird in proportion. FEATHER COLOR: Color in all classes is to be very rich, lustrous and pure with much sheen. All self-colored birds to be evenly colored throughout. Where two or more colors are present on the same feather, these colors should be in sharp contrast to each other. CONDITION: Feathers to be medium hard and smooth. Body to be well filled with firm flesh. 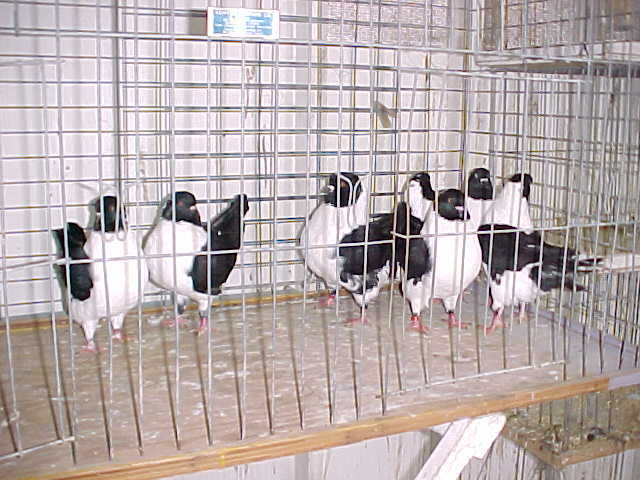 There are four basic color patterns in the Modena breed: barred, checked or tri-marked, T-pattern, and barless is the fourth alternative (allele) but is seldom seen. The desirable bar pattern has a clear solid colored wing with two evenly curved bars, to be as wide as possible, starting over the back and curving down to the bottom of the wing. The back edge of each bar is edged with a distinct, fine pencil line. This edging is indistinct in ash-red birds. The checkered or tri-marked shows the same two bars except they are irregular or saw-toothed along the back edge. Each feather on the shoulder portion of the wing between the wing butts and the bars is checked with portions of the ground color and the bar color, the two colors being separated by a fine V-shaped edging. This edging is also indistinct in the ash red birds. The T-pattern shows none of the basic ground color on the wing - the whole wing being the same color of the bar of the color family. The wing can be clear, laced or T-checked. The lacing should be distinct and of the same width on each feather. The T-checked birds should show this same lacing along with a definite wedge of the bar edging color on each feather. The tail bar of each color shall match the smooth spread pigment of the individual bird. Blue Intense - Black tail bar. Blue dilute - Dun tail bar. Brown Intense - Brown tail bar. Brown dilute - Khaki tail bar. Ash red - Light ash or lavender, however, it is usually indistinguishable. There are three basic color pigments in Modenas: Blue, Brown and Ash Red. In all three color pigments, the ground color becomes darker as we progress from the barred pattern to the tri or check pattern to the T-pattern. The following color chart is arranged in such a manner as to show the relationship to our Modena colors to each other in regard to pigment and pattern. The color descriptions apply to both Schietti and Gazzi with the exception of the white on the Gazzi body. BLUE (Blue pigment - Intense - Bar pattern) Head color to be a rich even shade of medium blue-gray. Neck feathers a bit darker shade showing a rich sheen of primarily green and secondary purple. The wing feathers to be a lighter shade of blue-gray with the color carried out through the secondary and primary feathers and blending in with the blackish tips of these feathers. When folded, you should see two bars of rich bronze with a fine pencil line of black. The lower back and rump should be an even shade of medium blue-gray. The tail is a bit darker shade of blue-gray. BRONZE TRI (Blue pigment - Intense - Check pattern) The head, neck and body similar to the blue, but a darker shade with the neck feathers showing plenty of rich green sheen. The tri markings on the wings to be open, and carried evenly to the wing butts. Each feather showing portions of bronze and blue with a black V separating the two colors. BRONZE (Blue pigment - Intense - T-pattern) Head and neck to be a deep purplish color shading to black showing plenty of rich green sheen and luster. Breast, back and body feathers to be a bluish black color throughout. Tail is blue-black. (Bronze color on head markings and on fluff under tail is permitted on Gazzi, but not preferred). Wing color to be a deep, clear, rich shade of bronze. Flights to have bronze color running on both sides of quill and blending into the black of the tips. Quills to be black. As in all T-patterns, there are three divisions: Clear, laced and T-checked. The clear is described above. The laced has each bronze wing feather laced in black. In the T-checked variety, every feather has the black lacing plus a wedge or check of black. BLACK (Blue pigment - Intense - Spread factor) Color over entire body, head, neck and wings to be coal black with plenty of sheen showing throughout, but especially on the neck. The black should be even throughout and should extend down into the under feathers. SILVER (Blue pigment - Dilute - Bar pattern) Head color a rich shade or light neutral gray shading to fawn. Neck feathers a bit darker shade of the same color. The wing feathers should be a lighter shade of gray-fawn with color carried well out through the primary and secondary feathers blending in with the dun colored tips. When folded, you should see two bars of rich sulphur edged with a pencil line of dun. Tail a bit darker shade of gray-fawn. SULPHUR TRI (Blue pigment - Dilute - Check or Tri pattern) The head, neck and body a medium shade of gray-fawn, a bit darker than the color on the silvers. Tri markings on the wings to be open and carried evenly to the wing butts. Each feather on the wing showing portions of sulphur and gray-fawn divided by a V marking of dun color. SULPHUR (Blue pigment - Dilute - T-pattern) The head, neck and body and tail color to be a deep rich dun color. Wing color to be a deep rich shade of sulphur. (Sulphur color on the head and fluff under tail of Gazzi is permitted, but not to be preferred). Three divisions as in all T-patterns: clear sulphur, dun laced and dun checked. DUN (Blue pigment - Dilute - Spread factor) Color over entire body, head, neck and wings to be a rich, even shade of brownish steel gray throughout. SILVER-DUN (Brown pigment - Intense - Bar pattern) The body and wing color is a light clear brownish-gray shading to brown on the head and hackle. The bars on the wings are rich russet-red color with a pencil edging of brown. RUSSET-TRI (Brown pigment - Intense - Check or Tri markings) The head, neck and body color a clear, medium shade of brownish-gray, a bit darker than on the silver dun. Tri markings on the wings to be open and carried to the wing butts showing portions of russet and brownish-gray with a brown V on each feather separating the two colors. RUSSET (Brown pigment - Intense - T-pattern) The head, neck and body color a medium shade of brownish-gray, a bit darker than on the russet-tri. The wing color is a plain, rich russet-red color. Three classes: plain, brown laced or brown checked. BROWN (Brown pigment - Intense - Spread factor) The head, neck, body and wings and tail should be an even shade of rich chocolate brown. SILVER-CREAM (Brown pigment - Dilute - Bar pattern) Body, head, neck, wing and tail color a soft tan-gray shading to khaki on the neck and neck hackle. The bars on the wings are a clear shade of ochre with an edging of khaki. OCHRE-TRI (Brown pigment - Dilute - Check or Tri pattern) Body, head, neck, wing and tail color a soft tan-gray blend shading to khaki on the neck and neck hackle. A bit darker than on the silver-cream. Tri markings on the wings to be open and carried evenly to the wing butts showing portions of the tan-gray and ochre separated by a V of khaki on each feather. OCHRE (Brown pigment - Dilute - T-pattern) Body, head, neck and wing and tail color a medium shade of tan-gray shading to khaki on the head and hackle. Color a bit darker than on the ochre tri. The wing color is plain ochre. Three divisions: plain, laced or checked with khaki. KHAKI (Brown pigment - Dilute - Spread factor) The head, neck, wing and body and tail should be an even shade of khaki. RED CHECKER (Ash Red pigment - Intense - Check or Tri pattern) The body color a clear, medium dark lavender-gray shading to a rich claret-red on the head and hackle. Checkering on the wings to be open and carried evenly to the wing butts showing on each wing feather, portions of lavender-gray and claret-red. The tail is lavender-gray with as little black flecking as possible. CREAM (Ash Red pigment - Dilute - Bar pattern) The body and wing color a very soft cream-gray shading to a rich golden cream on the head and hackle. Wing bars a rich golden cream. Tail a very pale cream-gray shading to ash white with as little flecking as possible. YELLOW CHECKER (Ash Red pigment - Dilute - Check or Tri-pattern) The body color soft cream-gray shading to a rich golden cream on the head and hackle. Body color a bit darker than on the breams. Checkering on the wings to be open and carried evenly to the wing butts. Each feather on the wing showing portions of cream-gray shading to ash white with as little flecking as possible. RED (Red pigment - Intense - Recessive red factor) A deep even shade of red, more of a chestnut, leaning a bit toward blood red over all portions. Color carried down to the skin with feather shafts colored red. Should show plenty of sheen on the neck. Beak and toe nails light horn color. GOLD (Red pigment - Pale factor - Recessive red factor) Color midway between red and yellow, but with a deep orange cast. This color is distinctly different from red and yellow, being recessive to red, but dominant to yellow. Beak and toe nails light horn color. YELLOW (Red pigment - Dilute - Recessive red factor) A deep even golden yellow color throughout. Color carried well down to the skin with feather shafts colored yellow. Showing plenty of sheen on the neck. Beak and toe nails flesh color. LAVENDER (Blue pigment - Intense or Dilute - Milky and Spread factor) In the intense variety, the color is very often rich lavender-gray throughout. In the dilute variety, the color is a soft silver-lavender shade. ANDALUSIAN (Blue pigment - Intense - Indigo and Spread factor) The body and tail to be an even shade of midnight blue shading to black on the head and neck. The wing is a bit lighter with dark blue edging on each feather. The Indigo factor may be applied to any standard color but only the black indigo as described here is to be known as andalusian. GRIZZLE (Any pigment - Intense or Dilute - Grizzle factor - Bar pattern) Head, neck, body, wing and tail color the same as the basic, with the addition of white flecks superimposed on the top of the standard color. This grizzling effect to be most noticeable upon the body, shoulder, head and neck, while nearly absent on the wing bars and tail bar. An evenly distributed uniform grizzling is desired. The grizzle factor may also be applied on any of the standard patterns. MAGNANI (Any pigment - T-pattern - Almond factor) Magnani is a factor which alters or modifies any color that it is introduced into by causing flecks of various colors to appear in the feathering over all parts of the bird. The base color to strive for is a rich yellow brown or almond color. The flecks vary in size and color but should be even in distribution. There must be at least three (3) colors on the bird. Flecking is usually more predominant on the head, neck and flights, but if on every feather of the bird, so much the better. Each feather of the primaries and secondaries should have three colors in patches. The even distribution of the three or more colors throughout the bird is called break. Perfection would be the same amount of break on each feather. The more break and the better the distribution, the better the color of the Magnani. WHITE (No feather pigment) Feathers on head, neck, body, tail and wings shall be pure white. The quills and all parts shall be white. Bull or orange eyes permitted. Eye cere red, beak and toe nails flesh color. ARGENT (Any pigment - Toy Stencil factor) The Argent group differs from other standard classes in wing coloration only, all body, head and tail colors being comparable. 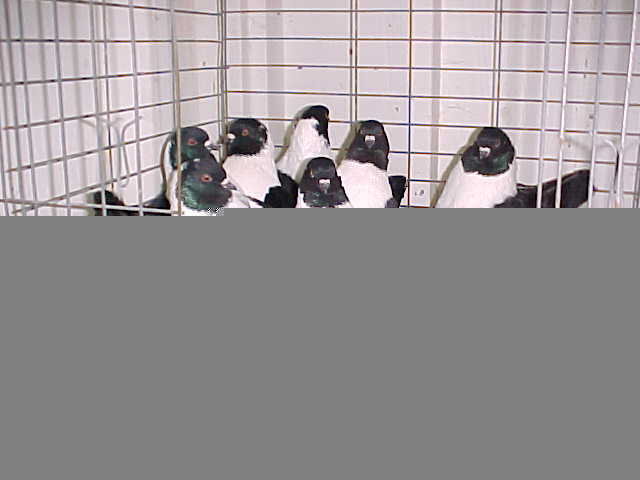 Argents are bred in three patterns: barred, tri markings and T-pattern laced. The difference in wing color on Argents is due to the Toy Stencil factor as a silvery white in areas where the bronze factor is found in other colors. Argents also have white patterns on otherwise self colored birds. The standard recognizes the color classes for Blue, Black, Indigo, Russet, Brown, Red and Yellow; the latter being recessive red colorations All other colors to be shown as N.C.C. (Non-classified color). Laced Argents should be rich in body color with the wing feather of the white field being distinctly laced with a fine edging of the same coloration as the body pigment. Spangle Argents to be the same in color as the T-pattern except a check pattern should be present instead of laced. Barred Argents to have white bars. N.C.C. (Non-classified Colors) These classes are for all colors that are different by virtue of color pigment, pattern, or color modifiers from those classes now recognized. They are divided into 3 groups: Schietti, Gazzi, and Argent. The color description should be included in entry. Example: Bronze barred blue indigo - N.C.C. Schietti. Point cuts must be in accordance to the degree of the fault and in relation to the points allowed in the section in which the fault occurs, except in cases of complete and absolute nonconformity. Example: Black beak on red schietti, pearl eyes, partly black or black beak on white schietti. Station - Leaning too far forward or backward. Head not held high. Neck drawn too far back. Lacking in tail lift. Flights not resting on tail. Size and shape of body - Body too long or narrow. Body too shallow, lacking depth. Crooked keel. Keel too long and not curved. Body too small, lacking in substance. Body too square or angular lacking overall roundness. Head - Flat head, not well rounded. Head too narrow in width. Pinched in face. Beetle brows, drooped eye lids. Head too small for balance. Neck - Neck too thin and long, lacking fullness and graduation. Showing distinct gullet or pinched at throat. Eye - Pale or lusterless eye color, but allowance made for somewhat light color in brown pigmented birds. Coarse, prominent, or contrasting ceres, except in white schietti where a red cere is desired. Color - Dull or faded color. Color lacking sheen. Colors blending together to produce impure or smutty effect. Bronze cast on body, neck and head. Any off colored feathers in white or colored sections. Markings and patterns - Foul feathers, uneven markings on Gazzi. Bib too deep or too far back on Gazzi. Uneven lacing or checkering on T-pattern birds. Lack of lacing on laced Argents giving the bird a washed out appearance. Any sign of ticking on wings of barred birds. Traces of third bar. Narrow bars. Closed patterns on Tri colored birds. Wings - Prominent wing butts. Scissored wings. Open over back, wing coverts not covering back well. Wings not lying flat on tail. Tail - Awry tail. Tail too long. Broad tail, not folded tightly. Legs and feet - Cow hocked or buckling legs. Legs too short or too long. Toes not well spread. Unmatched toe nail color. Legs not placed in center of body. Legs not straight. Condition and feathering - Loose feathers or long feathers. Any tail or wing feather missing due to moult. Excessive trimming. Soft feather. Stained or soiled feathers. White above the vent under the tail area. Loose, twisted feathers on neck or near cheeks. Soft spongy body condition, lacking firm solid flesh condition. Feathers on lower leg or feet. Noticeable cleft in feathers on breast. White, broken bull or unmatched eyes. (Bull eyes allowed in whites only). Split keel, completely white primary or secondary wing feathers, completely white tail feathers (except in whites). Neck shaking while being judged, wings carried below the tail. Extreme trimming. Birds sick or in otherwise poor condition physically. Faking in any manner beyond normal trimming and cleaning. Noticeable cleft in feathers on breast. Birds showing other than true Modena type. Disqualifications shall consist of white flights, bull eyes in other than white schietti and other than obvious Modena faults and so judged.